Boat: 33ft Racer Desighned by: "Andrew Burke"
I'm the new happy owner of 33ft racer aquired on sweat no less..
Bare Cabin, no engine, Excellant arsenal of sails though, I've been out on the water non stop and the more I sail her the more I love her handles like a dream, (what a feeling to be passing out 40ft Cats on a close Haul) but i have alot of questions. It's a big change dealing with running backs and shrouds that connect vertically to the beam none going fore or aft. The former owner set her up as a crossed rig (Double spread, Quarter Mast) My first concern is my fore stay and my back stay. I've tightened my fore to the last and she still sags with the jib. I have this fear of tightening my back stay too much. By the rivets I can see in the mast I know the Mast has been broken before driven hard in some Regatta or other. How much should I tention my Back Stay ????? An how do I get rid of the Sag in my fore stay... Without putting to much Pressure on my mast??? The rigging has been set up for a crew of 8 people to race her, I'm sailing solo (and not doing a bad job of it I may add, feel like I'm playing Twister most of the time though foot on the keel, outhaul sheet in me mouth, one hand holding a jib sheet and the other trying to ease a running back while curseing the other one on a tack... Need a better set up any advice? - - Do not tighten the forestay to try to stop the foresail from sagging. That is an impossibility. check out the books on racing and "backstay" adjustments. Racers normally have adjustable back stays so they can control the "bend" of the main mast aft to increase main sail efficiency. A normal main mast is raked aft about 2 to 4 degrees. Racing sailboats have different amount of rake depending upon the designer. Cat's have even more rake aft than monohulls. - - If the separation line around the mast about midway up is straight with flush rivets - then your mast is one of the "new" style masts that ships from the factory in 2 parts. Then the 2 pieces of mast are assembled in the boatyards and mounted on the boat. Shipping full length, single piece masts is just too expensive these days so modern masts come in "part A and part B". Talk to other sailor with "racing boats" and watch how they do their boats. But don't screw with shroud and stays unless you really know what you are doing. You can lose the whole rig (which is rather expensive) if you take the mast "out of column." I would suggest getting an experienced rigger with racing experience to put your shrouds and stays back to where they belong. Tell us more about the boat: Designer, model, age, etc. and about the rig. As has been pointed out, tightening the forestay will not help your problem (and may well make it worse - too much forestay and you might, for example, risk inverting your mast so that it curves forward). Your primary tool for tightening your forestay is the running backstays (a.k.a. "runners"). As a rule, you have the windward runner tight and the leeward runner loose (so that you can ease the traveller and main sheet to control the mainsail). As you go through a tack or gybe, you pull in the leeward runner (that is about to become the windward runner) through the tack or gybe and release the windward (about to become the leeward) runner. Don't release the "old" runner until the "new" runner is at least hand tight, especially downwind - thats how masts get broken. I repeat: You need 1 runner to be at least hand tight at all times. The backstay itself, is used more for tuning the shape of your mast...particularly if you have checkstays. Basically, by pulling on your backstay (and releasing your checkstays, if you have them), you bend the mast more... which basically flattens your mainsail - allowing you to sail higher, but reducing the power. Easing the backstay will straighten the mast, making the mainsail fuller and more powerful. N.B. It would be well worth getting a qualified mast rigger or a decent sailmaker (or both) to have a look at your mast, and advise you on how best to "tune" it for optimum sail performance. If your mast is not properly shaped, you can not only reduce your performance, but also, potentially, damage your mast. I think he might be talking about a B+R, Bergstrom and Ridder, rig which Gord had posted a link from another thread how to properly tension it for Seldon masts. My guess is that it is probably applicable to other masts. Hi IrieSailor, asuming you a have a fractional rig, the runners adjust the mast rake and if the rig is a masthead rig use the backstay for mast rake, some forestay sag is ok, you never going to have tight forestay, is imposible , you have swept spreaders?? a good experiment if you have a hidraulic backstay tensioner is to sail upwind with full jib and main and heel the boat 20 to 30 degrees , stand in the bow and look up along the forestay , put a friend or a crewmember in the hidraulic and loose the backstay a litle , then start tightening the backstay until tightening no longer reduce the sag in the forestay , this indicate the maximun backstay tension, and remember to much backstay or runers tension and if your boat is built light , distortion in the hull hapen, the rig need to work in the seas with litle movement, you have a babystay in the rig?? anyway do the test with 2 o 3 persons onboard , pick up a day with a nice breeze and to the test underway, i hope you see the diference, cheers. ➥ B & R rig, on a Hunter? Lars Bergström died in 1997, when an experimental glider he was testing crashed about two miles from the airport at Wauchula, Fla. He was 62. In Addition to the B&G rig, he also invented the Windex wind indicator, and several other boating innovations. Thanks for all the excellant advice, my rig is a 3/4 fractional with the back stay and two running backs connected a bit below the mast head from the transom as you guessed. The Boat was desighned and Built by the late "Alan Burke" Originally named "Bruggadune" a legend in Barbados for raceing he broke records with this boat.The current owner had her dry docked just rotting away. I offered to take on repair work, maintenance, fees ect. Got the mast up and set the rigging best as I could. Being used to a standard cruising Bermuda rig this was a challenge and a mystery to me, so I didnt tighten anything too much except for me shrouds to straighten the mast. I did read up on useing the running backs an have been useing them in corresponding windward / leeward tacks & Gybes since we launched her. It's good to know it's normal to have a bit of sag in my forestay. We sail a J24 as well and it's the opposite everything was set up for me and all the standing rigging was taught nothing sagged. I have experimented as you suggested: was on a starboard beam reach yesterday in solid wind with the running back as tight as I could get it. Back stay was slightly tensioned and forestay was still sagging with me jib. At the moment my backstay is running through a double purchase. I just bought a turnbucke and will set it up tomorrow this might offer me some more scope I also realized me shrouds are missing pins god I could of had a disaster out there... Thanks again will keep you posted. Like the Idea of having so much scope on shaping the main. Oh.. What's a checkstay?? There should be two running backstays - both start at the mast, at the same height as the forestay attachment to the mast, both go down to the transom, one either side of centre. 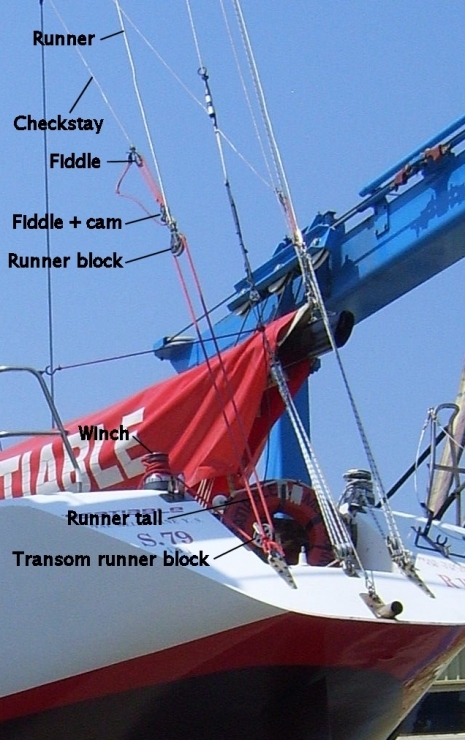 Typically each running backstay will have a "standing" part, aka "runner" which ends with a turning block a few feet above the deck, and a "running" part, aka "runner tail" that attached to the transom, goes up through the turning block at the end of the "standing" part, down through another turning block at the transom, then up to a runner winch on the deck near the transom. Typically, the standing part of the runner will be 1x19 stainless steel wire (although high spec rope is becomeing more popular). The running part of the runner will be rope. The runner winches are usually self-tailing. The backstay is usually also usually 1x19 stainless wire, usually smaller diameter than the standing part of the runner. It will typically have a double, or even triple block system on the bottom for purchase. Again, typically the running part of the backstay system will come forward...usually to where it can be adjusted by the mainsail trimmer, because with this style of rig, the backstay is used more for mainsail shape than actual mast support. Checkstays - commonly, where you have runners, you also have checkstays - these are stays that go from about half way up the mast down to the bottom end of the standing part of the runner. They also have a standing part and a running part. The checkstays are also there mostly to allow you to shape the mainsail. Pulling on the checkstay (and letting of the backstay) will straighten the mast, releasing checkstay will allow more bend (especially in conjunction with pulling on the backstay). Having a mast that is so flexible has its advantages in terms of trimming / shaping sails, but its main disadvantage is that this type of mast section is not particularly strong. In choppy conditions, the mast can start to pump (flex). Pulling on the checkstays can help reduce this mast pump (sometimes in conjunction with a rope from the 2nd spreaders to the middle of the foredeck). If you do have the rig system we are talking about, then if the mast and rigging is correctly tuned, you should be able to get your forestay as straight as an arrow, just by tightening your runner (you may need to crank plenty of runner on). If you can't you really should speak to a mast rigger and / or sailmaker. Of course, it is possible that the boat hull is so old and soft that tightening the runners is flexing the hull rather than tightening the forestay (quite a commom occurence, unfortunately, on old IOR boats built too light and worked too hard), but I sincerely hope that this is not the case. I have no "check-stays" no winches for the running backs, and by the looks of things I'm lacking a 2nd set of running blocks. Was wondering why we had to work so hard to get any propper tension with the running backs.. The double block on me back stay is also a massacre. The check stays by first observation would greatly ease the troubles incurred in raising the main sail as well. I'm forever running back and forth trying to pull the runnin backs off the Luff while raiseing. How and where do they connect to the mast? Thanks for taking the time to help me out. I'm really beginning to see what I need to do to set up my rig. Your right about the mast jumpin bout in choppy conditions. I tried downhauling, tightening me boot strap, even left me topping lift attached.. to no avail, I understand why now. Looks like we have a budget version.. Sadly tourism is dead in Barbados at the moment and I'm on a budget. I do have spare winches though!! The rest looks fairly easy to set up except for the fiddle and the fiddle cam.. I did check the hull, but have'nt watched it below deck whilst sailing will do that as well. I think we will take your advice and sail the boat over to the building dock and have someone help me to get this set up right.. Let me rephrase.. about 15 experts will come over and try to help me. An with any luck one of em might know what he's talking bout. Everyone is as Sailor in Barbados. Not many racers. Glad to get some straight forward advice. Drinks on me. should ye ever end up in our waters. Be a little cautious about my advice. I haven't actually seen your rig, so what I have said may not necessarily be correct. What I have described is how things work with a standard 3/4 fractional rig with in line spreaders, runners and checkstays. You may not even have that set-up. Please do seek local professional advice. On my boat, the checkstays go from the top of the runner block on the standing part of the runner to the mast, mid way between the upper and lower spreaders. Bear in mind, though, that although I have a 2-spreader rig, I also have jumper struts and diamond to support the top of the mast above the top of the cap shrouds (which only go to 3/4 of the way up the mast).